Before the play even begins, "Psychic Utopia" lets you know that its artistic ambition matches that of its risk-taking characters. The shortest way to describe Psychic Utopia is to say it captures the rise and fall of a fictional Oregon commune. It's called the Center, and like most communes, it's a destination for people who are seeking love, friendship and spiritual enlightenment. Yet, recounting the play's loose plot doesn't begin to do it justice. Psychic Utopia fills you with the same heady feeling its characters seek: the intoxicating thrill of venturing into the unknown. Those characters include a disgruntled former swimsuit model (Sascha Blocker), a Parisian hungry to escape a loveless marriage (Jenni Green-Miller) and a gay man recovering from anorexia and electroshock therapy (Jean-Luc Boucherot). The nameless characters are all led to the Center by a desire to be liberated from what they believe to be oppressively mundane lives. But as the play progresses, the Center is revealed to be another form of oppression. Written by playwright Andrea Stolowitz, the cast and director Jonathan Walters, Psychic Utopia kicks off Hand2Mouth's first official season. Though the company has been creating some of the city's most adventurous theater for over a decade, they've never produced plays on a regular schedule. Clearly, the change doesn't mean they're domesticating. Before the play even begins, Psychic Utopia lets you know that its artistic ambition matches that of its risk-taking characters. As you enter the theater, the actors offer you a warm, scented cloth and invite you to remove your shoes. Throughout the play, the actors interrupt the narrative to interact with the audience, sometimes just to simply say things like, "Thank you for being present with us tonight." Psychic Utopia is based on actual accounts of commune life, so it's no surprise that it depicts the Center with both rapturous fascination and muckraking realism. In the beginning when the characters tumble into an idyllic world of meditation, drugs, therapy and free love, the theater's lighting is low and romantic. But as the dubious machinations of the Center's leadership are revealed, the lighting becomes bright and harsh, forcing us to see the Center for what it really is: a scam calculated to ensnare the desperate, the lonely and the naive. But Psychic Utopia isn't a heavy-handed critique of society. Rather than pity or psychoanalyze the characters, the play simply seeks to understand their lives at the Center. That means illuminating the commune's darker side, but it also means acknowledging that the Center really does offer glorious, mind-expanding experiences. Psychic Utopia is a mind-expanding experience in its own right. The play flows dreamily from one moment to the next, powered by eerie, ambient music. That spirit of wondrous weirdness extends to the actors, who deliver most of their lines in hushed, hypnotic voices, except for a heart-pounding scene where they rampage across the stage, waving streamers and chanting nonsensically in rough, animalistic voices. It's a bizarre sight, but it's also a mesmerizing illustration of how life at the Center has unleashed a primal aggression its inhabitants have long suppressed. Near the end of the play, the actors ask you to turn to the person sitting next to you and ask, "What are you seeking?" It's a question that's next to impossible to answer. Yet there is something beautiful about the play's generous and inclusive spirit. Psychic Utopia is largely about how the Center, for all its flaws, unites a group of strangers simply by asking them to listen to each other. Fittingly, the play strives to do the same. 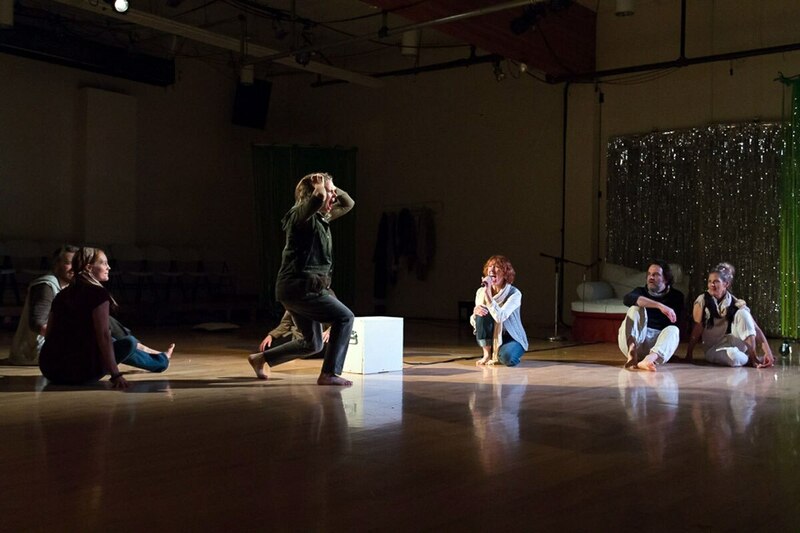 See It: Psychic Utopia is at New Expressive Works, 810 SE Belmont St., hand2mouththeatre.org. 7:30 pm through Dec. 2 and at 2 pm Dec. 3. $25.